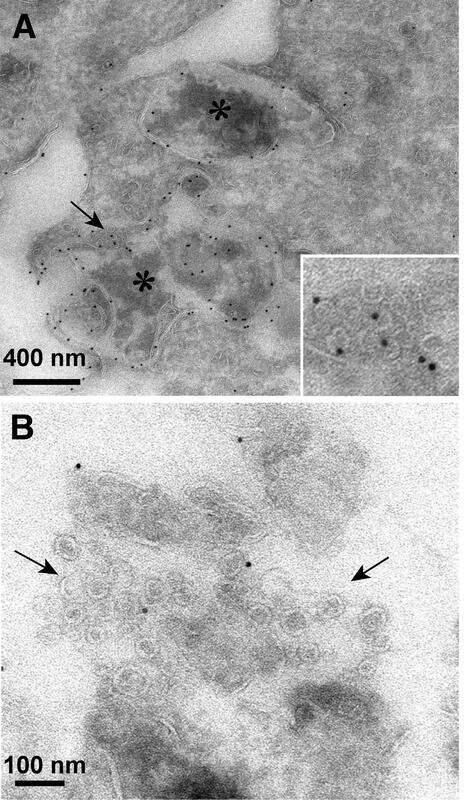 We have demonstrated that oligodendrocytes release membrane microvesicles of 50-80 nm in diameter known as exosomes. Exosomes are secreted from cells by regulated fusion of multi-vesicular bodies with the plasma membrane and release of the intralumenal vesicles into the extracellular space. They have been implicated in the maintenance of cellular homeostasis and in intercellular communication. Oligodendroglial exosomes carry a number of myelin proteins along with metabolically active enzymes and moreover RNA. We are studying their role in intercellular communication in the nervous system and their contribution to pathology in myelin disease. (A) Fusion profiles of multivesicular endosomal compartments in oligodendrocytes. (B) Extracellular exosomal vesicles carrying the myelin protein protein PLP. Krämer-Albers, E.M., Bretz, N., Tenzer, S., Winterstein, C., Möbius, W., Berger, H., Nave, K.A., Schild, H. and Trotter, J. (2007) Oligodendrocytes secrete exosomes containing major myelin and stress-protective proteins: Trophic support for axons? Proteomics Clin. Appl. 1, 1446-1461.